My Aunt Janet is such a gracious hostess. Her house is in the perfect location for my dad's side of the family to have get-togethers so she nicely offers her house for BOTH Thanksgiving and Christmas!! And this year she and my Uncle Randy did it even though Uncle Randy has been fighting cancer for the past several months. He received great news and is feeling much better just in time for the holidays but I know that hosting this year must have been especially challenging. Aunt Janet loves nature so I used this hand-painted baby alpaca yarn for her wrist warmers. She is a serious crafter, has her own work space out in the garage, so these will come in very handy, allowing her to still work with her fingers while keeping warm. I also made a scarf with this yarn but forgot to get a picture. 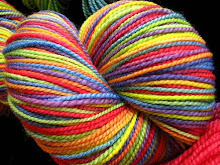 I LOVE this yarn brand. Chris does too and he has a special place in his heart for alpaca yarn. He is already commissioning me to make him an afghan with it! 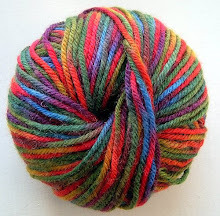 There is a big yarn sale on New Year's Day so that will be my next project! He is requesting dark blue, maroon, and tan. I can't wait because this is fabulous yarn to work with. Here is a link to it.